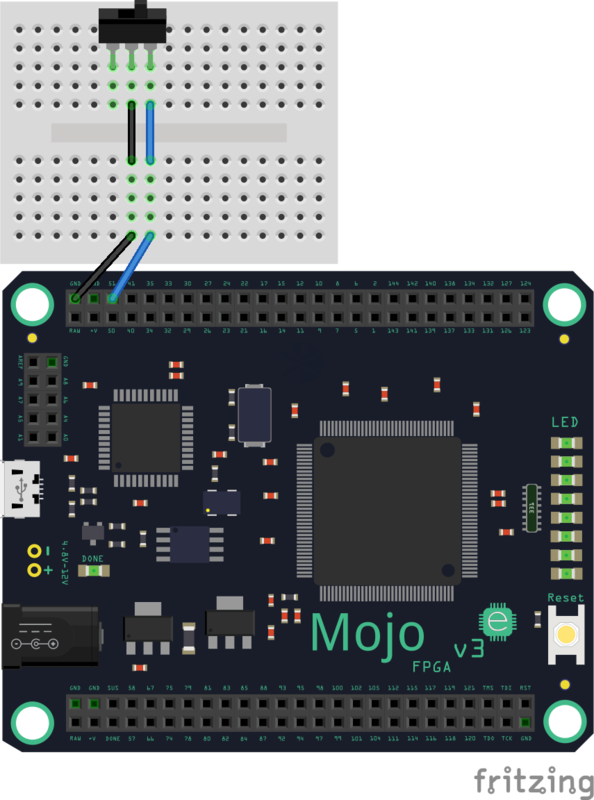 Implementing a simple binary counter in the Mojo FPGA IDE, I wanted to make the LEDs display a count down in response to a switch position. I decided to make a reversible slow counter that lets you choose which direction to count in (UP or DOWN). When you set the direction to UP, the initial value of the counter is 0 and it counts up from there. When the direction is DOWN, the counter is initialized to 255 (MAX value possible with 8 LEDs) and it counts down. To setup the circuit, I put a switch on a breadboard and connected one end to GND and another to pin 51. As you can see, the switch is named switch1. // clock. This ensures the entire FPGA comes out of reset at the same time. This means that there are two counters running simultaneously. We see the value of each depending on the state of the switch. I noticed as I switched between the counters that they had the same pattern, except that where the UP counter had the LED on, the DOWN counter had the same LED off. This led me to Wikipedia where I learned about the ones' complement. I wrote about this discovery in a previous post: How I accidentally learned something unexpected from a simple binary counter. By simply adding the ~, I set the value of the LEDs to the inverted value of the counter, giving me the same result as having another counter running alongside it counting in the opposite direction.